My Chicago Mommy - Extreme Couponing Chicago: *BEST SELLER* Sport-Brella Portable All-Weather and Sun Umbrella 8-Foot Canopy $34.49 Shipped (Retail $45) - WE LOVE OURS!!!! *BEST SELLER* Sport-Brella Portable All-Weather and Sun Umbrella 8-Foot Canopy $34.49 Shipped (Retail $45) - WE LOVE OURS!!!! Right now you can get the Sport-Brella Portable All-Weather and Sun Umbrella 8-Foot Canopy for $34.49 shipped (Retail $45). 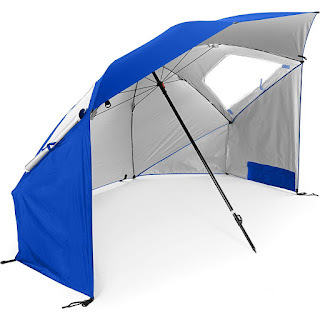 A beach umbrella, sun tent, rain shelter, and more, the Sport-Brella gives you instant, portable protection from the elements regardless of your activity. The Sport-Brella sets up in seconds and features a large canopy that shields an entire family or team while lounging on the beach or cheering on the team from the sidelines.